Cement is a hydraulic inorganic cementing material powder. After mixing with water into a paste, can be hardened in the air, or hardened in water better, and be able to sand, stone and other materials, firmly cemented together. Cement is an important building material, made with cement mortar or concrete, firm and durable, widely used in civil construction, water conservancy, national defense and other projects. Cement production process, limestone and clay as the main raw material, crushing, batching, grinding into raw material, cement kiln calcining feeding mature material, add appropriate amount of gypsum (sometimes mixed with mixed materials or additives) Ground Made. Cement is used primarily to concrete, the world's most versatile and durable construction material manufacture. Some other uses for cement, but now are more important. Solidification - one of them is a commonly used technique for management and disposal of a wide range of contaminated materials and waste, including radioactive waste. Cement is mixed in the contaminated substances immobilisation of pollutants and prevent that they migrate to plants, animals or people. The process is most often used to polluted industrial sites for rehabilitation and recreation reclaim. In cement production process, cement-breaker is most widely used because most raw materials must use to the cement, such as limestone, clay, iron ore and coal crushed process should be very important. 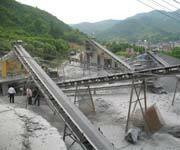 Usually we choose Jaw Crusher for cement breaker because Jaw Crusher is simply principle, easy maintenance and low cost. However, if the gamut of cement mining size is that we usually choose Cone Crusher or Impact Crusher in secondary or tertiary cement Crushing. In some manufacturing sites, we use one whole mobile crushing plant to complete the entire cement crushing and screening plants. The mobile crushing plant divide to Mobile Crusher Jaw Crusher, Mobile Impact Crusher and Mobile Cone Crusher, and the optional equipments have belt conveyor, vibrating feeder, vibrating screen, etc.